I am pretty sure that there is no one out there that loves carbs more than me. Pizzas, bagels, bread - basically any kind of carb is totally my jam. But being around food all day long and trying to rein it in a little bit when I am at home, I find myself making salads. The same old boring salad. So in an attempt to kick it up a notch I threw in some raw cauliflower to trick myself into thinking I was eating rice when it was cauliflower. And it worked! Here is my raw cauliflower rice bowl that is delicious and tasty and most importantly completely filling. Have you heard of the Spiralizer? A tool that basically spiralizes vegetables into pasta shapes. This salad was inspired by that. Although a little gimmicky, the good thing about the spiralzier is that is forces you to think about vegetables in a different way. Zucchini as pasta? No problem. Sweet potato in waffle form? Easy peasy. Same thing with cauliflower as rice (although I made mine in a food processor). This salad also has a secret weapon - oven fried chickpeas with cumin and smoked paprika. These little suckers are amazingly delicious. 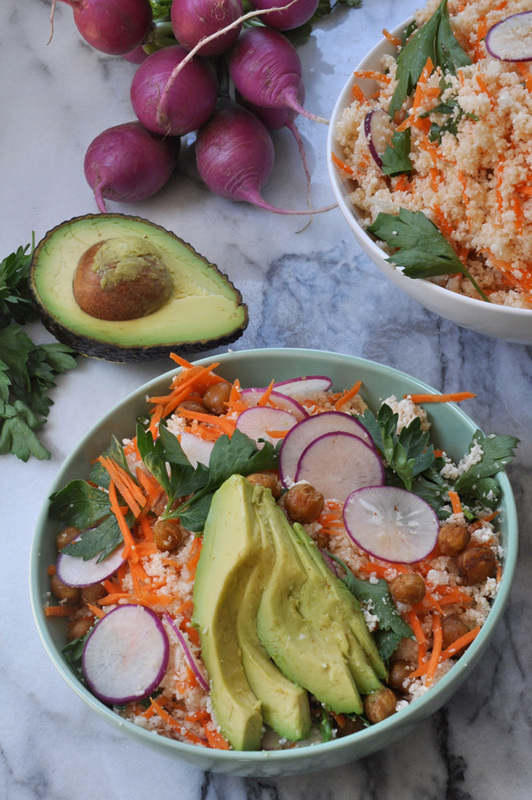 Combine them with the rice bowl and a Moroccan inspired dressing, I promise you will forget that there is no rice, or glaring carbs in this salad. So what do you think, would you ever try raw cauliflower as rice? I am sold. In a medium sized bowl, combine chickpeas, cumin, smoked paprika, salt, pepper and olive oil, Spread chickpeas onto baking sheet and bake until chickpeas are slightly crisp, about 30 minutes. In the bowl of a food processor, chop cauliflower until it resembles rice. Depending on the size of your cauliflower and food processor, this might need to be done in a couple batches. 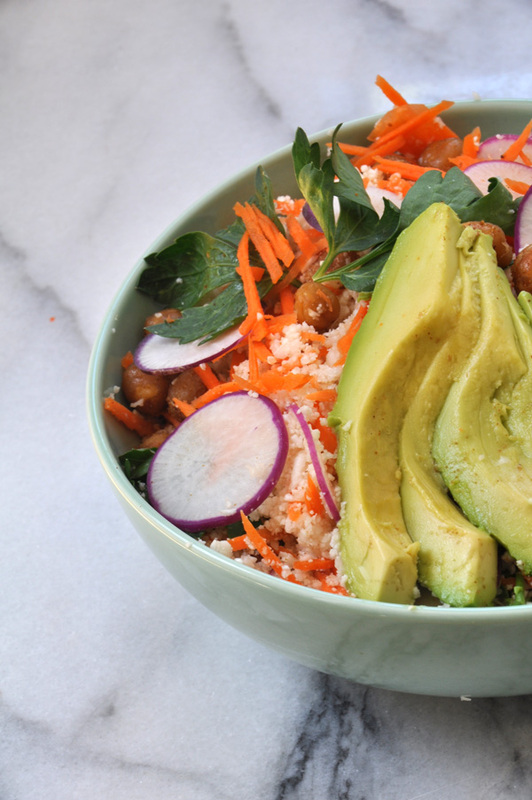 Combine chopped cauliflower with carrot, radish, avocado, parsley and chickpeas. Make the dressing by whisking together cumin, smoked paprika, honey, white wine vinegar, and olive oil. Taste the dressing for salt and pepper before tossing over the salad.